Japan's Prime Minister Shinzo Abe has called for a new interpretation of the constitution, which could pave the way for the military to fight overseas. 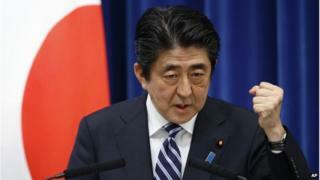 His call came hours after a panel of advisers - picked by Mr Abe - released a report recommending changes to defence laws. Japan's constitution bans acts of war and "the threat or use of force" to settle international disputes. China has criticised the move, accusing Japan of taking "negative actions". But Mr Abe has indicated he wants to re-examine the role of Japan's military to meet the changing security environment in the Asia-Pacific region. The government has long held the view that under international law, it has the right to collective self-defence - which is the right to use arms in stopping attacks on friendly countries. But it also believes that it cannot exercise that right because the constitution sets a limit on the use of armed strength. The panel's report on Thursday called for this position to be dropped and argued that Japan should be allowed to engage in collective self-defence, said news agency Kyodo. They also suggested a set of conditions be imposed to ensure this power would not be abused. They were making these recommendations in light of challenges posed by China and North Korea, they added. Mr Abe agreed that a review was needed on the current interpretation of the constitution. "It is necessary to deepen co-operation with other countries so that we can seamlessly... cope with any situation to protect our peaceful lives." But he also pledged that Japan would not again become "a country that wages war", report agencies. The changes, although modest, are extremely controversial, says the BBC's Rupert Wingfield-Hayes in Tokyo, and Mr Abe is certain to face stiff opposition. The move will likely please the US, with whom Japan has a long-standing security treaty, however. But it drew immediate criticism from Beijing. Chinese Foreign Ministry spokesman Hua Chunying said on Thursday that Abe's government was taking "negative actions" that raised concerns about Japan's true motives, according to agencies.